"Wynton Kelly always projects a happy feeling, regardless of the tempo." 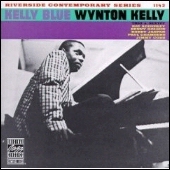 Wynton Kelly was a greatly underrated talent, who was both an elegant piano soloist with a rhythmically infectious solo style in which he combined boppish lines with a great feeling for the blues as well as a particularly accomplished accompanist, gifted with perfect pitch and a highly individual block chording style. Kelly's work was always highly melodic, especially in his ballad performances, while an irresistible sense of swing informed his mid and up-tempo performances. Though he was born on the island of Jamaica, Wynton grew up in Brooklyn. His academic training appears to have been brief, but he was a fast musical developer who made his professional debut in 1943, at the age of eleven or twelve. His initial musical environment was the burgeoning Rhythm and Blues scene of the mid to late 1940s. Wynton played his first important gig with the R&B combo of tenor saxophonist Ray Abrams in 1947. He spent time in hard hitting R&B combos led by Hot Lips Page, Eddie "Cleanhead" Vinson and Eddie "Lockjaw" Davis, in addition to the gentler environment of Johnny Moore's Three Blazers. In April 1949, Wynton played piano backing vocalist Babs Gonzales in a band that also included J.J. Johnson, Roy Haynes and a young Sonny Rollins. Kelly's first big break in the jazz world came in 1951, when he became Dinah Washington's accompanist. In July 1951 Kelly also made his recording debut as a leader on the Blue Note label at the age of 19. After his initial stint with Dinah Washington Kelly gigged with the combos of Lester Young and Dizzy Gillespie and recorded with Gillespie's quintet in 1952. Wynton fulfilled his army service between 1952 and the summer or 1954 and then rejoined Washington and Gillespie in 1955. By this time Kelly had become one of the most in demand pianists on record. He distinguished himself on record with such talent as J.J. Johnson, Sonny Rollins, Johnny Griffin and especially Hank Mobley whom Kelly inspired to some of his best work on classic Blue Note albums like Soul Station, Work Out, and Roll Call. Wynton proved himself as a superb accompanist on the Billie Holiday Clef sessions of June 1956 and showed his mettle both as an accompanist and soloist on the star-studded Norman Granz session with Coleman Hawkins, Paul Gonsalves, Dizzy Gillespie and Stan Getz in 1957 that produced the fine Sittin' In album on the Verve label. In 1957 Kelly left Gillespie and formed his own trio. He finally recorded his second album as a leader for the Riverside label in January 1958, six years after his Blue Note debut. In early 1959 Miles Davis invited Wynton to joint his sextet as a replacement for Bill Evans. Kind of Blue, recorded in March 1959, on which he shares the piano stool with Evans, Kelly excels on the track "Freddie Freeloader" a medium temp side that is closest to the more theory-free jazz of the mid-fifties. Wynton proved a worthy successor to Red Garland and Bill Evans in the Miles Davis combo, together with bassist Paul Chambers and drummer Jimmy Cobb, an old colleague from Dinah Washington's rhythm section, he established a formidable rapport. During his stay with Davis, Kelly recorded his fine Kelly Blue for Riverside and three albums for Vee Jay. By the end of 1962 Kelly, Chambers and Cobb formed the Wynton Kelly Trio, which soon made its mark. The Kelly Trio remained a regular unit for a number of years and reached the height of their popularity after they joined up with guitarist Wes Montgomery, resulting in three albums, a live set in New York's Half Note, a September 1965 studio album for Verve, and a live set at the Half Note for the Xanadu Label. Kelly's trio, now with Cecil McBee and Ron McClure kept working during the late 1960s until he died of an epileptic fit on April 12, 1971, aged only 39. 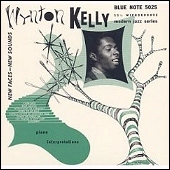 Wynton Kelly: First Sessions, Proper Records. Piano Interpretations, 1951, Blue Note. Wynton Kelly Piano, 1958, Riverside. Blues on Purpose, 1965, Xanadu. Smokin' at Half Note, 1965, Verve. The Last Session, 1968, Delmark.